When I saw this dress in the store window in New York, I knew I was going to have to buy it. I love this dress! 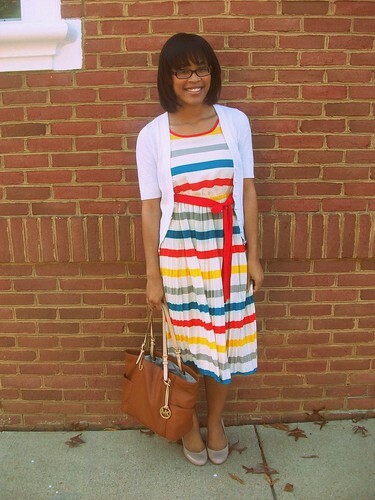 I love it because it’s the best thing I could find to look like this Marc Jacobs dress from his Spring 2011 collection. The original costs $628, but mine was $30! Don’t ask me why it took me so long to wear this, when I’ve had it since the end of July. We all make mistakes. Oh, I also can’t remember the store where I got it from. Mistake number 2…doesn’t matter anyways, its still an amazing dress! Previous Post It’s Time for a Giveaway! This dress is fun! Love the bright colors!